We started messing around with the Android version of Processing the other day. It was really easy to get some of our old sketches running on the emulator. Most sketches only required a one line change. It took a few tries to get all of the tools setup correctly to compile and push APKs out to the device, but we got our first sketches running tonight. 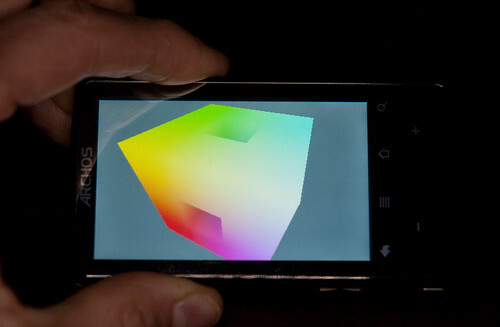 Here’s a picture of the rgb_cube demo running on an Archos 32.